Clean and Refresh Room Spray for the Summer. 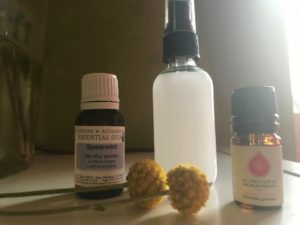 I created this room spray for this hot, humid, summer weather. The rooms are stuffy, or air-conditioned, so it’s nice to have a cool, refreshing scent to clear any odors out or make the room feel cooler. I combined Spearmint( Mentha spicata), Eucalyptus (Eucalyptus Globulus), Springwater and a bit of alcohol. You could also use this as a nice bathroom spray too! Eucalyptus (Eucalyptus Globulus)- helps with clearing the air and creating space! This can cleanse any leftover energy in the air of a room. Spearmint ( Mentha spicata)-helps with fatigue and stress- reducer. This can uplift your spirits. Recipe: Depends on what scent you like better. I had to play around with the recipe. 2 oz glass bottle, Springwater, Rubbing alcohol, Spearmint, and Eucalyptus. Fill up a bottle with a bit less than 2 oz of water, use about 1 Tb of Alcohol, 15-30 drops of essential oil. You can choose by the type of scent you prefer. Feel free to reach out to me with any questions.